DUBLIN, Ohio (AP) — Tiger Woods needed only two words to explain where the Memorial fits in on his road back from wherever he was to wherever he is going. When trying to chart his progress, golf becomes a lot like watching tennis. He wins at Sherwood, and then can't shake Robert Rock in Abu Dhabi. Phil Mickelson blows him away at Pebble Beach, and then Woods shoots a career-best final round of 62 to put a scare into Rory McIlroy. He withdraws from Doral with a sore Achilles tendon, and then wins by five at Bay Hill. He has the worst three-tournament stretch of his career, and then goes through a week at Muirfield Village where he hardly misses a shot. He’s back. He’s finished. He’s back. And on it goes. His remarkable rally at the Memorial makes the temptation greater than ever to proclaim that he has turned the corner and is picking up speed. Woods said he hit just about every shot exactly how he wanted to, with the exception of his second shot on the 10th that he pulled slightly while trying to play a fade. It found a bunker and led to bogey. He missed only one fairway, and that was only by a few inches into the first cut of rough. Equally impressive was his score, which ultimately is what matters. Not only did Woods overcome a four-shot deficit going into the final round, he was two shots behind with four holes to play as he posed in the fairway urging — begging — his 3-iron into the par-5 15th hole to carry beyond the false front of the green. It did, and he two-putted for birdie. Woods figured if he could make one more birdie over the closing stretch, it might be enough for him to get into a playoff. Minutes later, he was praying for par when his 8-iron bounced over the green at the par-3 16th into a horrible spot. The ball was nestled in the rough, and the path 50 feet to the hole looked impossible. Too short, and it would turn down a slope and leave a difficult two-putt bogey. Too strong, and it would race past the cup and into the water. With a full swing and a flop shot, the ball rode the crown of a ridge with just the right speed and dropped in for birdie not even he saw coming. He made one last birdie for good measure, a 9-iron into the 18th green that was played by a guy who looked as though he had won here before. It caught the ridge at the back of the green and rolled down to just inside 10 feet, giving him a 5-under 67 and a two-shot win. It was his fifth win at Muirfield Village, the fifth golf course on which he has won at least five times. And it was the 73rd win of his PGA Tour career, tying him with Jack Nicklaus, the tournament host who was there, as always, to greet Woods when he came off the 18th green. “He had to rub it in my face here, didn't he?” Nicklaus later said with a laugh. Nicklaus was gushing over the flop shot that Woods holed on the 16th, and it truly was magic. “I don’t think under the circumstances I’ve ever seen a better shot,” Nicklaus said. The last time Woods won the Memorial was in 2009, when he also rallied from a four-shot deficit on the final day with a 65. It was his second win of the year, and the U.S. Open was two weeks away at Bethpage Black, where Woods had won wire-to-wire seven years earlier. Woods had 14 majors, as he does now. That year was full of so many surprises. 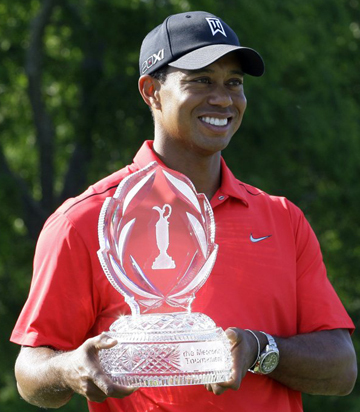 Woods won every tournament he played before the majors and failed to win any of them. By the end of the year, his problems were off the golf course and he hasn’t seriously challenged in the final hour of another major since then. He won at Bay Hill, and then had his worst performance ever at the Masters as a pro when he tied for 40th. Woods never broke par the last time the U.S. Open was played at The Olympic Club in 1998, though he was in the middle of changing his swing. He played the golf course last Tuesday and found it to be difficult, which it is. It is short by U.S. Open standards, though it plays long. If nothing else, Olympic served as the perfect tuneup for Muirfield Village. Does this make him a failure if he doesn’t win the U.S. Open? Is he done? Woods talked about his game being good in spurts at other tournaments, though it was clear — at least by how he hit the ball — that he had his fastball all week. The process is to put good rounds together. Maybe the next step is putting good tournaments together. In tennis terms, this would be a good time for a changeover. It’s best to wait until the end of the year — or at least until August, the end of the majors — to figure out where Woods stands.